I spent about 2 hours each on the first 2 elementals, they will all be used on the tabletop. I had just bought the 3 Army Painter inks, so I tested them on these. I like the results. I love this one from Lance and Laser "Elementals - Earth and Water" set. Its partner is somewhere unpainted in our figure stash. 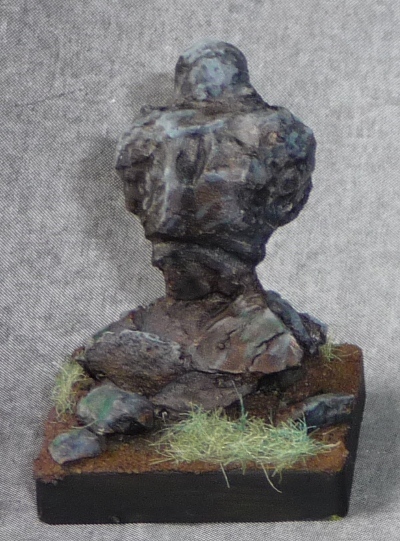 Ral Partha elemental from 11-426, very classic pose on this one. 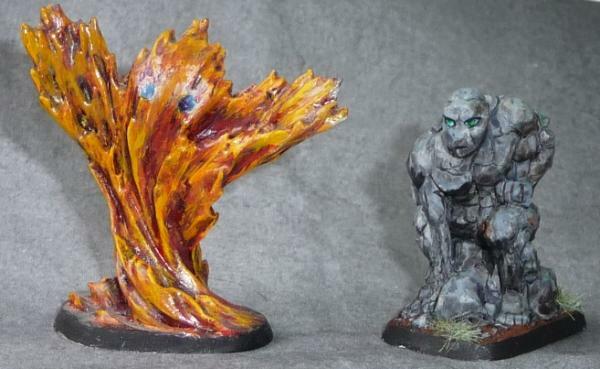 Here is the complete set, the Fire elemental was painted by my husband around 1990, using enamel paints. Sadly, he doesnt paint anymore , but he does help me with gluing, assembly and basing . 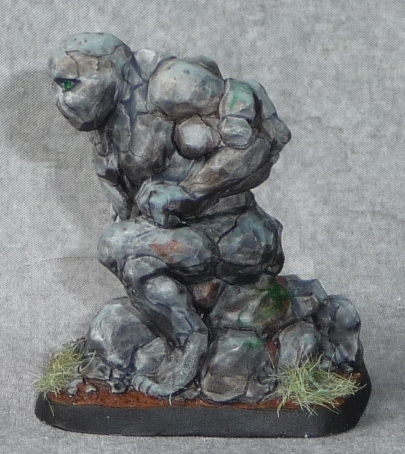 The ugliest earth elemental ever is definitely this one by TSR, part of the "Elementals Air and Earth" twopack from 1983. I didn't think he deserved more than an hour of paint time. It looks like an assemblage of bodybuilders. Fun! The Ral Partha elemental is my favorite, but I actually like the TSR one as well. 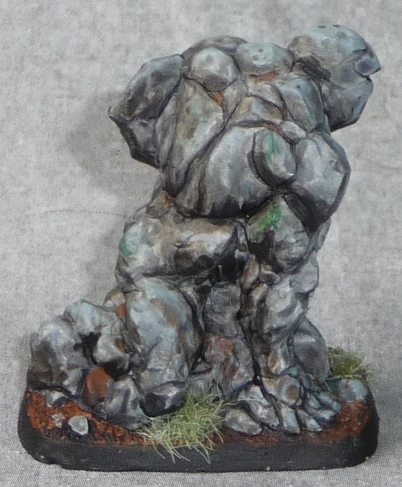 It seems appropriate for an elemental rock creature. Plus those eyes are too cute. what a nice group of earth elementals. i hadn't seen these guys before, and i'd like to see more. great work for only a few hours total. ObsidianCrane, thank you for the tip, I will keep an eye out for that mini. 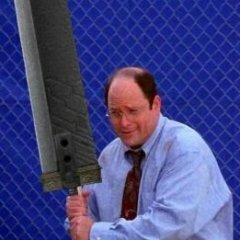 A quick search didn't reveal any for sale in the online stores I usually frequent. 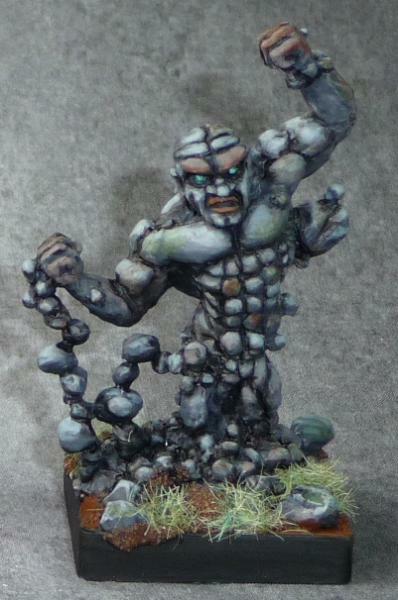 The Ral Partha is my favorite of these too. I think they are some good loking elementals and you have done a great job. 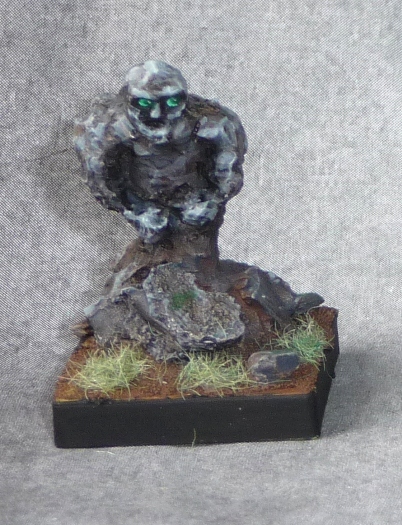 Finished another of the gifted old school minis, this one a Ral Partha (sez so on the base). I really like the sculpt on this one, so much detail...tiny shallow detail that would be easy to lose. 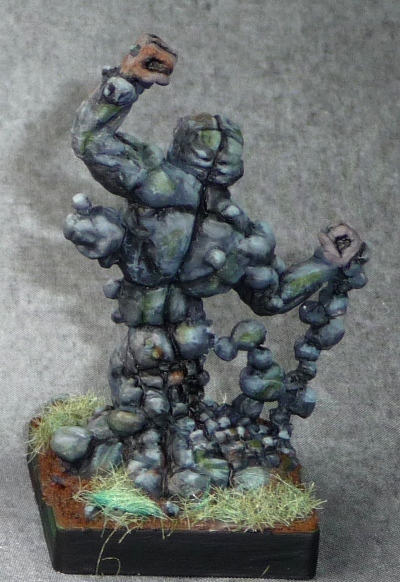 So I did very little highlighting after the sepia ink wash.
Now what to do about the base. I’m going to attach it to a larger base, but I’d like to be able to take that off someday in the future A) for RP verification, and B) to build a better base if I ever get into that. I’m wondering if regular white glue would be a good choice?